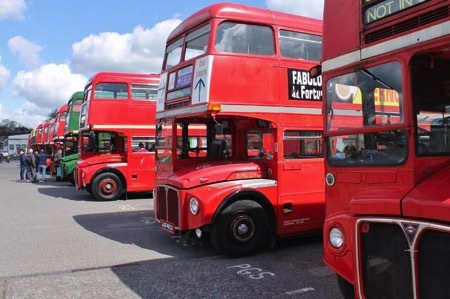 Dozens of London Transport’s iconic Routemaster buses will be marking the double-decker’s 60th anniversary at the London Bus Museum’s summer event on 26 June. 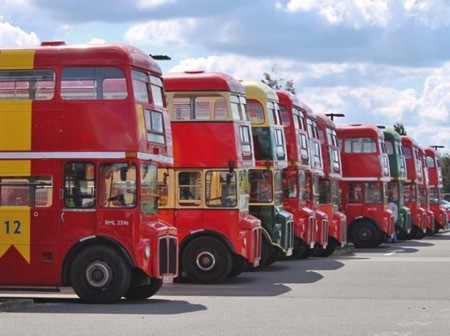 Supported by the Routemaster Association, the event at Brooklands Museum in Weybridge, Surrey will feature live bus services and excursions, and the organisers hope to have every major variant of the Routemaster on display. The first Routemaster bus entered service on Route 2 at Crystal Palace in February 1956 and the last was withdrawn from front-line service in December 2005. In all, 2,876 Routemasters were built of which, according to the Routemaster Association, 1,280 are still in existence. They can still be seen on the streets in London on Transport for London’s Heritage Route 15 between Tower Hill and Trafalgar Square and much further afield in various liveries and model variants. 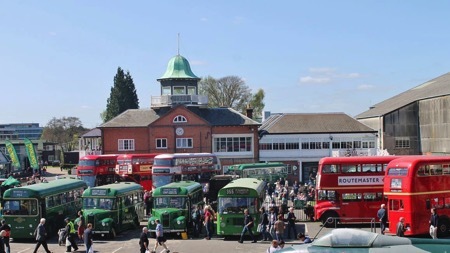 Visitors to the event can expect to see a variety of visiting buses and other vehicles as well as London Bus Museum’s own collection, which is housed in LBM’s Cobham Hall on the Brooklands Museum site. There will be excursions* to Guildford and Hampton Court on historic buses and, more locally, there will be the opportunity to ride on a Horse Bus*. Face painting* and a Playbus* will be laid on to keep youngsters entertained, and entry to the event includes access to all the aviation and motoring displays of Brooklands Museum. Extra paid attractions at Brooklands Museum such as rides in the 4D Theatre and the half-hour Concorde Experience will also be running all day. Collectors will be able to peruse the Market Place with models, books, artefacts and other historical items for sale with extra catering outlets ensuring that visitors are never far away from refreshment. Gates open to the public at 9.00am and admission charges are: Adults £11.00, Children £6.00, Seniors and Students £10.00, Family ticket (2 adults & up to 3 children) £30.00. The Concorde Experience is £5 for Adults and £3 for children, with rides in the 4D Theatre costing £4 for Adults and £2 for children. *There will be a small charge for the bus excursions, the Horse Bus rides, Playbus and face painting. Public parking will be in The Heights off Wellington Way – please follow event signage on the day. There will be a free bus service throughout day on Route 462 to take passengers using SouthWest Trains arriving at Weybridge Station to the event.